Lord Mansfield was born William Murray at Scone Palace in Scotland in 1705 and he was Chief Justice of the Kings Bench in England for 32 years. His long life (1705-1793) spanned most of the eighteenth century, and he was related to varying degrees with many of the momentous occasions of that time: the Jacobite uprising, the age of Enlightenment, the coffee house culture, the American Revolution, the Wilkes and Gordon riots and most famously for us today (although somewhat incorrectly), the question of slavery. He is remembered as the father of commercial law. First, the Jacobitism of his family played an important part in shaping his character, and in particular, made him reluctant to challenge the authority of the government. His vulnerability to charges of Jacobitism was one of the reasons for his timidity as a politician, and for his decision to pursue a career as a judge rather than to aim for the highest rung on the political ladder. The accusation of Jacobitism was a powerful one to be levelled against a Scot at the highest levels of British government, and it dangled over Mansfield’s head throughout his career. He had cause to be concerned: his father and two of his brothers had supported the Jacobite rebellion of 1715; at the age of twenty he wrote two letters to his brother-in-law Colonel John Hay, pledging his loyalty to the exiled pretender, and he was said to have drunk toasts to the Pretender as a young man. (Some time back, we saw Jacobite glassware at the National Gallery of Victoria- see here). It was anxiety to avoid these accusations, Poser argues, that led Mansfield to follow closely the government line and to take a very hard line on seditious libel. There was, however, also the question of loyalty to his patrons, and in this Mansfield was a thoroughly 18th century gentleman. There was nothing untoward in this: the web of patronage held the whole structure of government together. Just as he hitched his fortunes with those of the Duke of Newcastle, so he himself engineered the career of his nephew Lord Stormont (who sounded a bit of a dud, frankly). It was not nepotism: it was just the way things worked. 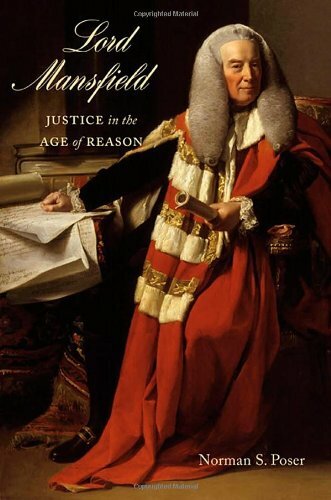 Mansfield’s career fitted very closely the trajectory described in Daniel Duman’s book The Judicial Bench in England 1727-1875 that I reviewed here. He attended Westminster school as did many other office-holders at the highest levels, went to Christ Church Oxford (which further fuelled the accusations about his Jacobitism, as it was seen as a hotbed of Jacobite sedition), joined the bar, was elected a member of Parliament, became Solicitor General, then Attorney General. There was not the squeamishness then that we feel now about the separation of powers, and as Solicitor General he was government spokesman in the House of Commons. But his involvement in parliamentary politics was just a stepping stone to the position that he really wanted: that of Chief Justice of the Kings Bench, which he attained in 1756, along with the peerage that transformed William Murray into the 1st Earl of Mansfield. He married Elizabeth Finch and was happily married for forty-six years, and although they had no children, they raised two great-nieces, as seen in the recent movie Belle. There was also a patronage connection with Thomas Mills, who was said to be his illegitimate son, and of course his nephew Stormont whom he assisted to be appointed French ambassador. 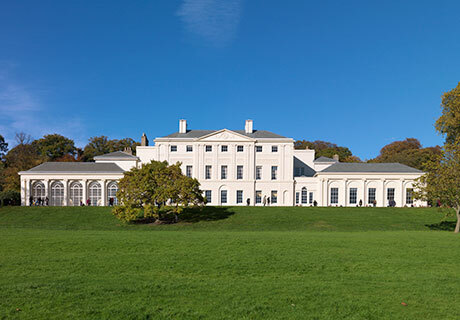 As well as his city house at Bloomsbury Square, he lived at Kenwood, now part of English Heritage and open to the public. The book is divided into two parts. The first is basically biography, arranged chronologically, and it gives a good sense of this intelligent, gregarious, ambitious man. He was a friend of Alexander Pope and the actor David Garrick, he engaged in the major social events of his time and he lived well. The second section is thematic and examines the major legal issues that he heard and expounded upon from the bench. The opening chapter in this section “Chief Justice of the Court of Kings Bench” gives a very clear explanation of the structure of the three common law courts and Mansfield’s behaviour as a judge. He expedited cases quickly and enlarged the work of Kings Bench (at the expense of the other two common law courts, Common Pleas and Exchequer), he had a good memory and he used humour. He believed in natural law- that laws are based on an eternal and immutable moral code, and he extended the jurisdiction of the court into the area of morals as well. He was essentially a humanist, with a focus on the minds, intentions and actions of individuals, rather than the operation of abstract rules. He respected precedent, but where necessary he would establish a new precedent based on ‘reason, justice and convenience’. However, in matters of commerce, he wanted certainty and hard law. He was hardline in matters of seditious libel as well, restricting the jury only to the question of whether the defendant was the writer, printer and publisher of a libel, and not allowing them to decide whether the writing in question was libellous or not. He was the judge who presided over the Wilkes trial, and then the trial related to the Junius letters- all trials which raised questions of civil liberty and freedom of speech. He is best known today for his findings in the Somersett case (regarding the use of habeas corpus with a slave who had been brought to England, escaped, and was to be sent to Jamaica against his will) and the Zong case which featured in the movie Belle. In both cases, Mansfield was wary of being drawn into making a broad statement against slavery which, as he was keenly aware, would affect Britain’s economic prosperity. Although he prided himself on the speed with which he heard justice, in these cases he delayed as much as he could, and deliberately crafted very narrow judgments. By no means could he be said to have ‘abolished’ slavery. He took a hard line against the rebels in the American Revolution, for which he was heavily criticized. While he reduced the disabilities for Roman Catholics and Dissenters, he was by no means the driving force of the Catholic Relief Act which was supported by both Houses of Parliament. Nonetheless, his house came under particular attention by rioters during the anti-Catholic Gordon riots, leading to the loss of his library and, tragically, the loss of two hundred notebooks containing his notes on the cases he had heard. The author of this book is an American academic, and you’re well aware that you’re reading a book written for an American audience in his attempts to draw parallels with American jurisprudence and judges. In the acknowledgments at the end of the book he thanks his wife, a non-lawyer, who has done all the non-lawyers amongst us a great service by alerting him to concepts, words and practices that might be unfamiliar. His explanation of the system of courts and the working of habeas corpus for this little non-lawyer here (me!) was the clearest that I have read anywhere- and that is high praise. This is judicial biography written the way I like it. This entry was posted in Biography, Book reviews and tagged Lord Mansfield. Bookmark the permalink.